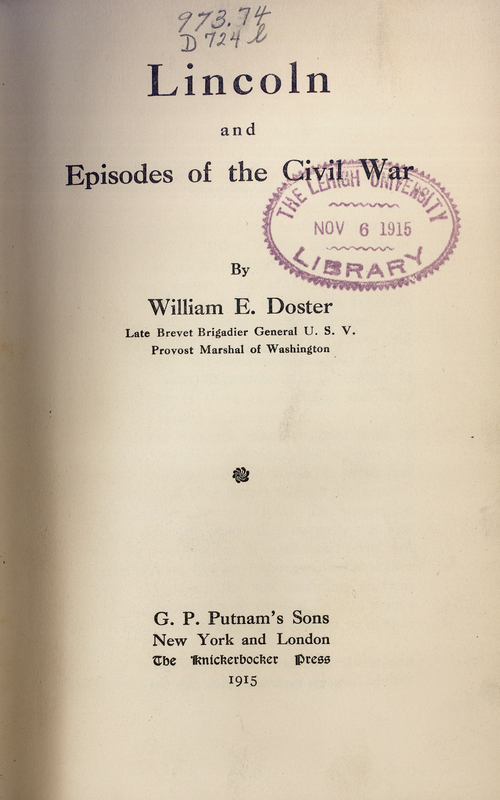 Title page of Lincoln and Episodes of the Civil War. Lincoln and Episodes of the Civil War. New York: G.P. Putnam's Sons, 1915. "A century ago", on February 12, 1909, the first chapter of this book, "Abraham Lincoln", was delivered as an address here at Lehigh University, for honoring President Lincoln's 100th birthday. The address was delivered by William Emile Doster who was born in Bethlehem and studied law and graduated successively from Yale (1857), then Harvard Law School and the University of Heidelberg, Germany. In 1861, he joined the Union Army as captain, then became a major in 1862 and was appointed to succeed General Porter as provost-marshal of the District of Columbia. In 1864, he resigned from service and practiced law in Washington, D.C. In 1873 he moved back to the Lehigh Valley. Doster was counsel for the Bethlehem Iron Company (later Bethlehem Steel Corporation) and the Lehigh Coal and Navigation Company. William Emile Doster was also on the faculty of Lehigh University, where he taught a course on law, "Practice in the County Courts of Pennsylvania," in the late 1870s.